Composed by Brian Harris. Repertoire, Classroom, General Instructional, Activities and Games. 16 pages. Published by Bandroom.com Publications (S0.191837). 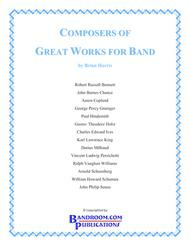 COMPOSERS OF GREAT WORKS FOR BAND is a text resource of single-page "life outlines" for 14 composers who contributed significant works to the wind literature repertoire. 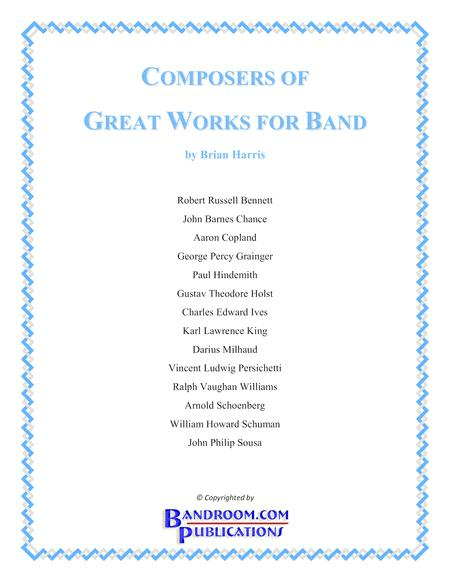 Information regarding each composer's life milestones and events, along with numerous anecdotes and trivia, are a perfect source for creating concert notes/comments or using as study handouts for students. NOTE: The audio attached to this listing is for Cheltenham March, written in the style and form of Holst. To learn about purchasing the music for Cheltenham March, search here on the SMP Digital Downloads site or at the below referenced site. It is not included in the above booklet. AUTHOR: Now retired, Brian Harris holds the Ph.D. in Music Education from the Florida State University and was a band director for over 30 years. Many of his arrangements and compositions are available at www.bandroom.com and through Sheet Music Plus Digital Downloads. easy to copy, pass out to kids, then give them a test on it.